Finding work can be a big problem in Indonesia. It's a huge country that's plagued by unemployment and overeducation; the typical toll booth worker in Indonesia holds an undergraduate degree. So says Gobann's Michael Luhukay, anyway, and his company has a plan to fix it. Luhukay noted that one problem with an online job site in Indonesia is that Indonesians still lack trust in internet services like this, and jobs are often still referral-based. 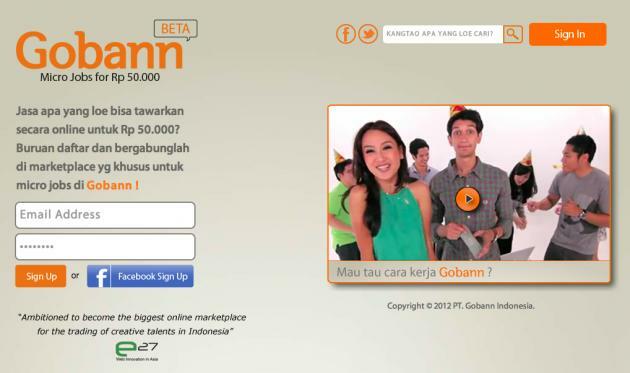 Gobann is a micro job market -- think fiverr -- that takes these factors into account to bring jobs to Indonesians via the web. Sellers -- anyone with a talent -- can log into the site and post about the services they offer with text, images, and video. But buyers can also register what they are looking for in the "demand feed." Each type of user can browse through the other, and can also see any friends in common on Facebook or other social media, which taps into the Indonesian preference for referral-based employment. Once a buyer and a seller want to connect, they pay a small fee -- 50,000 rupiah ($5.35) -- and then they do the deal; after which they can rate each other for future buyers and sellers to see. Luhukay says there is a prospective market of 55 million users and $112 million, and the company plans to make money from transaction fees, as well as advertisements and potentially licensing of its HR database in the future once user numbers are higher. Judge Leslie Loh asked about the company's targets, and Luhukay responded that Gobann is aiming for 500,000 users in the first year. To do this, the company will visit schools to attract students looking to moonlight, and partner with creative communities throughout the country. The service launched May 1st, and the company says it needs $300,000 to fund the first two years of operation. And what about that fiverr comparison -- what if fiverr comes to Indonesia? "Being localized will differentiate us," Luhukay said. This is a part of our coverage of Startup Asia Jakarta 2012, our startup event running on June 8 and 9. For the rest of our Startup Arena pitches, see here. You can follow along on Twitter at @startupasia, on our Facebook page, on Google Plus, or via RSS.